Proprietary Name: Cinacalcet Hydrochloride What is the Proprietary Name? Non-Proprietary Name: Cinacalcet Hydrochloride What is the Non-Proprietary Name? Cinacalcet Hydrochloride with NDC 70436-009 is a a human prescription drug product labeled by Slate Run Pharmaceuticals. The generic name of Cinacalcet Hydrochloride is cinacalcet hydrochloride. The product's dosage form is tablet, film coated and is administered via oral form. FDA Application Number: ANDA210207 What is the FDA Application Number? Why is cinacalcet medication prescribed? 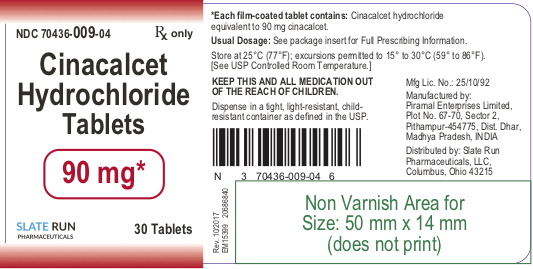 Cinacalcet hydrochloride tablets are indicated for the treatment of secondary hyperparathyroidism (HPT) in adult patients with chronic kidney disease (CKD) on dialysis [see Clinical Studies (14.1)].Limitations of Use: Cinacalcet hydrochloride tablets are not indicated for use in patients with CKD who are not on dialysis because of an increased risk of hypocalcemia [see Warnings and Precautions (5.1)]. Cinacalcet hydrochloride tablets are indicated for the treatment of hypercalcemia in adult patients with Parathyroid Carcinoma [see Clinical Studies (14.2)]. Cinacalcet hydrochloride tablets are indicated for the treatment of severe hypercalcemia in adult patients with primary HPT who are unable to undergo parathyroidectomy [see Clinical Studies (14.3)]. Cinacalcet hydrochloride tablets should be taken with food or shortly after a meal.Cinacalcet hydrochloride tablets are administered orally and should always be taken whole and not chewed, crushed, or divided. The recommended starting oral dose of cinacalcet hydrochloride tablets is 30 mg once daily. Serum calcium and serum phosphorus should be measured within 1 week and intact parathyroid hormone (iPTH) should be measured 1 to 4 weeks after initiation or dose adjustment of cinacalcet hydrochloride tablets [see Dosage and Administration (2.3)]. Cinacalcet hydrochloride tablets should be titrated no more frequently than every 2 to 4 weeks through sequential doses of 30, 60, 90, 120, and 180 mg once daily to target iPTH levels of 150 to 300 pg/mL. Serum iPTH levels should be assessed no earlier than 12 hours after dosing with cinacalcet hydrochloride tablets.Cinacalcet hydrochloride tablets can be used alone or in combination with vitamin D sterols and/or phosphate binders.During dose titration, serum calcium levels should be monitored frequently and if levels decrease below the normal range, appropriate steps should be taken to increase serum calcium levels, such as by providing supplemental calcium, initiating or increasing the dose of calcium-based phosphate binder, initiating or increasing the dose of vitamin D sterols, or temporarily withholding treatment with cinacalcet hydrochloride tablets [see Dosage and Administration (2.4) and Warnings and Precautions (5.1)]. The recommended starting oral dose of cinacalcet hydrochloride tablets is 30 mg twice daily. The dose of cinacalcet hydrochloride tablets should be titrated every 2 to 4 weeks through sequential doses of 30 mg twice daily, 60 mg twice daily, and 90 mg twice daily, and 90 mg 3 or 4 times daily as necessary to normalize serum calcium levels. Serum calcium should be measured within 1 week after initiation or dose adjustment of cinacalcet hydrochloride tablets [see Dosage and Administration (2.4) and Warnings and Precautions (5.1)]. Once the maintenance dose has been established, serum calcium should be measured approximately monthly for patients with secondary hyperparathyroidism with CKD on dialysis, and every 2 months for patients with parathyroid carcinoma or primary hyperparathyroidism [see Dosage and Administration (2.2,2.3)].For secondary hyperparathyroidism patients with CKD on dialysis, if serum calcium falls below 8.4 mg/dL but remains above 7.5 mg/dL, or if symptoms of hypocalcemia occur, calcium-containing phosphate binders and/or vitamin D sterols can be used to raise serum calcium. If serum calcium falls below 7.5 mg/dL, or if symptoms of hypocalcemia persist and the dose of vitamin D cannot be increased, withhold administration of cinacalcet hydrochloride tablets until serum calcium levels reach 8.0 mg/dL and/or symptoms of hypocalcemia have resolved. Treatment should be reinitiated using the next lowest dose of cinacalcet hydrochloride tablets [see Dosage and Administration (2.2)]. Cinacalcet hydrochloride tablets are available as film-coated tablets.Cinacalcet hydrochloride tablets are formulated as light-green, oval-shaped, film-coated tablets marked with “CN” on one side and “30” or “60” or “90” on the other side of the 30 mg, 60 mg, or 90 mg strengths, respectively. Cinacalcet hydrochloride tablets treatment initiation is contraindicated if serum calcium is less than the lower limit of the normal range [see Warnings and Precautions (5.1)]. Cinacalcet hydrochloride tablets lowers serum calcium and can lead to hypocalcemia [see Adverse Reactions (6.1)]. Significant lowering of serum calcium can cause paresthesias, myalgias, muscle spasms, tetany, seizures, QT interval prolongation and ventricular arrhythmia. Life threatening events and fatal outcomes associated with hypocalcemia have been reported in patients treated with cinacalcet hydrochloride tablets, including pediatric patients. The safety and effectiveness of cinacalcet hydrochloride tablets have not been established in pediatric patients [see Pediatric Use (8.4)]. Cinacalcet hydrochloride tablets are not indicated for patients with CKD not on dialysis [see Indications and Usage (1)]. In patients with secondary HPT and CKD not on dialysis, the long term safety and efficacy of cinacalcet hydrochloride tablets have not been established. Clinical studies indicate that cinacalcet-treated patients with CKD not on dialysis have an increased risk for hypocalcemia compared with cinacalcet-treated patients with CKD on dialysis, which may be due to lower baseline calcium levels. In a phase 3 study of 32 weeks duration and including 404 patients with CKD not on dialysis (302 cinacalcet, 102 placebo), in which the median dose for cinacalcet was 60 mg per day at the completion of the study, 80% of cinacalcet-treated patients experienced at least one serum calcium value < 8.4 mg/dL compared with 5% of patients receiving placebo.QT Interval Prolongation and Ventricular ArrhythmiaDecreases in serum calcium can also prolong the QT interval, potentially resulting in ventricular arrhythmia. Cases of QT prolongation and ventricular arrhythmia have been reported in patients treated with cinacalcet hydrochloride tablets. Patients with congenital long QT syndrome, history of QT interval prolongation, family history of long QT syndrome or sudden cardiac death, and other conditions that predispose to QT interval prolongation and ventricular arrhythmia may be at increased risk for QT interval prolongation and ventricular arrhythmias if they develop hypocalcemia due to cinacalcet hydrochloride tablets. Closely monitor corrected serum calcium and QT interval in patients at risk receiving cinacalcet hydrochloride tablets. SeizuresIn clinical studies, seizures (primarily generalized or tonic-clonic) were observed in 1.4% (43/3049) of cinacalcet-treated patients and 0.7% (5/687) of placebo-treated patients. While the basis for the reported difference in seizure rate is not clear, the threshold for seizures is lowered by significant reductions in serum calcium levels. Monitor serum calcium levels in patients with seizure disorders receiving cinacalcet hydrochloride tablets.Concurrent administration of cinacalcet hydrochloride tablets with calcium-lowering drugs including other calcium-sensing receptor agonists could result in severe hypocalcemia. Closely monitor serum calcium in patients receiving cinacalcet hydrochloride tablets and concomitant therapies known to lower serum calcium levels.Educate patients on the symptoms of hypocalcemia and advise them to contact a healthcare provider if they occur.If corrected serum calcium falls below the lower limit of normal or symptoms of hypocalcemia develop, start or increase calcium supplementation (including calcium, calcium-containing phosphate binders, and/or vitamin D sterols or increases in dialysate calcium concentration). Cinacalcet hydrochloride tablet dose reduction or discontinuation of cinacalcet hydrochloride tablet may be necessary [see Dosage and Administration (2.2)]. Cases of gastrointestinal bleeding, mostly upper gastrointestinal bleeding, have occurred in patients using calcimimetics, including cinacalcet hydrochloride tablets, from postmarketing and clinical trial sources. The exact cause of GI bleeding in these patients is unknown.Patients with risk factors for upper GI bleeding (such as known gastritis, esophagitis, ulcers or severe vomiting) may be at increased risk for GI bleeding when receiving cinacalcet hydrochloride tablet treatment. Monitor patients for worsening of common GI adverse reactions of nausea and vomiting associated with cinacalcet hydrochloride tablets [see Adverse Reactions (6.1)] and for signs and symptoms of GI bleeding and ulcerations during cinacalcet hydrochloride tablet therapy. Promptly evaluate and treat any suspected GI bleeding. In postmarketing safety surveillance, isolated, idiosyncratic cases of hypotension, worsening heart failure, and/or arrhythmia have been reported in patients with impaired cardiac function, in which a causal relationship to cinacalcet hydrochloride tablets could not be completely excluded and which may be mediated by reductions in serum calcium levels [see Adverse Reactions (6.2)]. Adynamic bone disease may develop if iPTH levels are suppressed below 100 pg/mL. One clinical study evaluated bone histomorphometry in patients treated with cinacalcet hydrochloride tablets for 1 year. Three patients with mild hyperparathyroid bone disease at the beginning of the study developed adynamic bone disease during treatment with cinacalcet hydrochloride tablets. Two of these patients had iPTH levels below 100 pg/mL at multiple time points during the study. In three 6-month, phase 3 studies conducted in patients with CKD on dialysis, 11% of patients treated with cinacalcet hydrochloride tablets had mean iPTH values below 100 pg/mL during the efficacy-assessment phase. If iPTH levels decrease below 150 pg/mL in patients treated with cinacalcet hydrochloride tablets, the dose of cinacalcet hydrochloride tablets and/or vitamin D sterols should be reduced or therapy discontinued. In three double-blind, placebo-controlled clinical trials, 1126 patients with CKD on dialysis received study drug (656 cinacalcet hydrochloride tablets, 470 placebo) for up to 6 months. The most frequently reported adverse reactions are listed in Table 1. Seizures were observed in 1.4% (13/910) of cinacalcet-treated patients and 0.7% (5/641) of placebo-treated patients across all completed placebo controlled trials.Table 1. Adverse Reactions with Frequency ≥ 5% in Patients on Dialysis in Short-Term Studies for up to 6 Months Placebo Cinacalcet Hydrochloride Tablets (n=470) (n=656) EventIncluded are events that were reported at a greater incidence in the cinacalcet hydrochloride tablets group than in the placebo group. : (%) (%) Nausea 19 31 Vomiting 15 27 Diarrhea 20 21 Myalgia 14 15 Dizziness 8 10 Hypertension 5 7 Asthenia 4 7 Anorexia 4 6 Pain Chest, Non-Cardiac 4 6 Dialysis Access Site Infection 4 5In a randomized, double-blind placebo controlled study of 3,883 patients with secondary HPT and CKD receiving dialysis in which patients were treated for up to 64 months (mean duration of treatment was 21 months in the cinacalcet hydrochloride tablets group), the most frequently reported adverse reactions (incidence of ≥ 5% in the cinacalcet hydrochloride tablets group and a difference ≥ 1% compared to placebo) are listed in Table 2.Table 2. Frequency of Adverse Reactions in Dialysis Patients Treated for up to 64 Months in a Long-Term Study1Placebo (n=1923)Cinacalcet Hydrochloride Tablets (n=1938) 3699 subject-years4044 subject-yearsPercent of subjects reporting Adverse Reactions (%)90.993.2Nausea15.529.1Vomiting13.725.6Diarrhea18.720.5Dyspnea11.513.4Cough9.811.7Hypotension10.511.6Headache9.611.5Hypocalcaemia1.411.2Muscle spasms9.211.1Abdominal pain9.610.9Abdominal pain upper6.38.2Hyperkalemia6.18.1Upper respiratory tract infection6.37.6Dyspepsia4.67.4Dizziness4.77.3Decreased appetite3.55.9Asthenia3.85.4Constipation3.85.01 Adverse reactions that occurred in ≥ 5% frequency in the cinacalcet hydrochloride tablets group and a difference ≥ 1% compared to the placebo group (Safety Analysis Set)Crude incidence rate = 100 * Total number of subjects with event/ nn=Number of subjects receiving at least one dose of study drugAdditional adverse reaction rates from the long-term, randomized, double-blind placebo controlled study for cinacalcet hydrochloride tablets versus placebo are as follows: seizure (2.5%, 1.6%), rash (2.2%, 1.9%), hypersensitivity reactions (9.4%, 8.3%). In 26-week studies of patients with secondary HPT and CKD on dialysis 66% of patients receiving cinacalcet hydrochloride tablets compared with 25% of patients receiving placebo developed at least one serum calcium value less than 8.4 mg/dL, whereas, 29% of patients receiving cinacalcet hydrochloride tablets compared with 11% of patients receiving placebo developed at least one serum calcium value less than 7.5 mg/dL. Less than 1% of patients in each group permanently discontinued study drug due to hypocalcemia. In a randomized, double-blind, placebo-controlled study in patients with secondary HPT and CKD receiving dialysis in which patients were treated for up to 64 months (mean duration of treatment was 21 months in the cinacalcet group), 75% of patients receiving cinacalcet hydrochloride tablets compared with 29% of patients receiving placebo developed at least one serum calcium value less than 8.4 mg/dL and 33% of cinacalcet patients compared with 12% of patients receiving placebo had at least one serum calcium value less than 7.5 mg/dL. Most of the cases of severe hypocalcemia less than 7.5 mg/dL (21/33=64%) occurred during the first 6 months. In this trial, 1.1% of patients receiving cinacalcet hydrochloride tablets and 0.1% of patients receiving placebo permanently discontinued study drug due to hypocalcemia. Cinacalcet is partially metabolized by CYP3A4. Dose adjustment of cinacalcet hydrochloride tablets may be required if a patient initiates or discontinues therapy with a strong CYP3A4 inhibitor (e.g., ketoconazole, itraconazole). The iPTH and serum calcium concentrations should be closely monitored in these patients [see Clinical Pharmacology (12.3)]. Cinacalcet is a strong inhibitor of CYP2D6. Dose adjustments may be required for concomitant medications that are predominantly metabolized by CYP2D6 (e.g., desipramine, metoprolol, and carvedilol) and particularly those with a narrow therapeutic index (e.g., flecainide and most tricyclic antidepressants) [see Clinical Pharmacology (12.3)]. Risk SummaryLimited case reports of cinacalcet hydrochloride tablets use in pregnant women are insufficient to inform a drug associated risk of adverse developmental outcomes. In animal reproduction studies, when female rats were exposed to cinacalcet during the period of organogenesis through to weaning at 2-3 times the systemic drug levels (based on AUC) at the maximum recommended human dose (MRHD) of 180 mg/day, peripartum and early postnatal pup loss and reduced pup body weight gain were observed in the presence of maternal hypocalcemia [see Data].The estimated background risk of major birth defects and miscarriage for the indicated populations is unknown. In the U.S. general population, the estimated background risk of major birth defects and miscarriage in clinically recognized pregnancies is 2-4% and 15-20%, respectively.DataAnimal DataIn pregnant female rats given oral gavage doses of 2, 25, 50 mg/kg/day cinacalcet during gestation, no teratogenicity was observed at doses up to 50 mg/kg/day (exposure 4 times those resulting with a human oral dose of 180 mg/day based on AUC comparison). Decreased fetal body weights were observed at all doses (less than 1 to 4 times a human oral dose of 180 mg/day based on AUC comparison) in conjunction with maternal toxicity (decreased food consumption and body weight gain).In pregnant female rabbits given oral gavage doses of 2, 12, 25 mg/kg/day cinacalcet during gestation, no adverse fetal effects were observed (exposures less than with a human oral dose of 180 mg/day based on AUC comparisons). Reductions in maternal food consumption and body weight gain were seen at doses of 12 and 25 mg/kg/day. Cinacalcet has been shown to cross the placental barrier in rabbits.In pregnant rats given oral gavage doses of 5, 15, 25 mg/kg/day cinacalcet during gestation through lactation, no adverse fetal or pup (post-weaning) effects were observed at 5 mg/kg/day (exposures less than with a human therapeutic dose of 180 mg/day based on AUC comparisons). Higher doses of 15 and 25 mg/kg/day cinacalcet (exposures 2 to 3 times a human oral dose of 180 mg/day based on AUC comparisons) were accompanied by maternal signs of hypocalcemia (periparturient mortality and early postnatal pup loss), and reductions in postnatal maternal and pup body-weight gain. Risk SummaryThere are no data regarding the presence of cinacalcet hydrochloride in human milk or effects on the breastfed infant or on milk production. Studies in rats showed that cinacalcet was excreted in the milk. The developmental and health benefits of breastfeeding should be considered along with the mother’s clinical need for cinacalcet hydrochloride tablets and any potential adverse effects on the breastfed infant from cinacalcet hydrochloride tablets or from the underlying maternal condition. The safety and efficacy of cinacalcet hydrochloride tablets have not been established in pediatric patients. Dosing with cinacalcet hydrochloride tablets in a pediatric study was stopped because of a fatality in a cinacalcet hydrochloride tablets -treated individual. The individual was noted to be severely hypocalcemic at the time of death. The cause of death was multifactorial and a contribution of cinacalcet hydrochloride tablets to the death could not be excluded [see Warnings and Precautions (5.1)].Additional information describing clinical studies in which efficacy was not demonstrated in pediatric patients is approved for Amgen Inc.'s SENSIPAR® (cinacalcet hydrochloride). However, due to Amgen Inc.'s marketing exclusivity rights, this drug product is not labeled with that pediatric information. Of the total number of subjects (n=1136) in clinical studies of cinacalcet hydrochloride tablets, 26 percent were 65 and over, and 9 percent were 75 and over. No overall differences in the safety or effectiveness were observed between these subjects and younger subjects, and other reported clinical experience has not identified differences in responses between the elderly and younger subjects, but greater sensitivity of some older individuals cannot be ruled out [see Clinical Studies (14) and Clinical Pharmacology (12.3)]. No dosage adjustment is necessary for renal impairment [see Clinical Pharmacology (12.3)]. Patients with moderate and severe hepatic impairment should have serum calcium, serum phosphorus, and iPTH levels monitored closely throughout treatment with cinacalcet hydrochloride tablets because cinacalcet exposure (AUC0-infinite) is increased by 2.4 and 4.2 fold, respectively, in these patients [see Clinical Pharmacology (12.3)]. Overdosage of cinacalcet hydrochloride tablets may lead to hypocalcemia. In the event of overdosage, patients should be monitored for signs and symptoms of hypocalcemia and appropriate measures taken to correct serum calcium levels [see Warnings and Precautions (5.1)]. Since cinacalcet hydrochloride tablets is highly protein bound, hemodialysis is not an effective treatment for overdosage of cinacalcet hydrochloride tablets. Cinacalcet Hydrochloride Tablets are a calcimimetic agent that increases the sensitivity of the calcium-sensing receptor to activation by extracellular calcium. Cinacalcet Hydrochloride Tablets contain the hydrochloride salt of cinacalcet. Its empirical formula is C22H22F3N·HCl with a molecular weight of 393.9 g/mol (hydrochloride salt) and 357.4 g/mol (free base). It has one chiral center having an R-absolute configuration. The R-enantiomer is the more potent enantiomer and has been shown to be responsible for pharmacodynamic activity.The hydrochloride salt of cinacalcet is a white to off-white, crystalline solid that is soluble in methanol or 95% ethanol and slightly soluble in water.Cinacalcet hydrochloride tablets are formulated as light-green, oval-shaped, film-coated, tablets for oral administration in strengths of 30 mg, 60 mg, and 90 mg of cinacalcet as the free base equivalent (33 mg, 66 mg, and 99 mg as the hydrochloride salt, respectively).The hydrochloride salt of cinacalcet is described chemically as N-[1-(R)-(-)-(1-naphthyl)ethyl]-3-[3-(trifluoromethyl)phenyl]-1-aminopropane hydrochloride and has the following structural formula:Inactive IngredientsThe following are the inactive ingredients in cinacalcet hydrochloride tablets: colloidal silicon dioxide, corn/maize starch, crospovidone, FD&C Blue #2/Indigo carmine AL, iron oxide yellow, hypromellose, lactose monohydrate, magnesium stearate, microcrystalline cellulose, partially pre-gelatinized starch, titanium dioxide and triacetin. The calcium-sensing receptor on the surface of the chief cell of the parathyroid gland is the principal regulator of PTH synthesis and secretion. Cinacalcet, the active ingredient in cinacalcet hydrochloride tablets, directly lowers PTH levels by increasing the sensitivity of the calcium-sensing receptor to extracellular calcium. The reduction in PTH is associated with a concomitant decrease in serum calcium levels. Reduction in iPTH levels correlated with the plasma cinacalcet concentrations in patients with CKD. The nadir in iPTH level occurs approximately 2 to 6 hours post dose, corresponding with the maximum plasma concentration (Cmax) of cinacalcet. After steady-state cinacalcet concentrations are reached (which occurs within 7 days of dose change), serum calcium concentrations remain constant over the dosing interval in patients with CKD.Reductions in PTH are associated with a decrease in bone turnover and bone fibrosis in patients with CKD on dialysis and uncontrolled secondary HPT. After oral administration of cinacalcet, Cmax is achieved in approximately 2 to 6 hours. Cinacalcet Cmax and AUC(0-infinite) were increased by 82% and 68%, respectively, following administration with a high-fat meal compared with fasting in healthy volunteers. The Cmax and AUC(0-infinite) of cinacalcet were increased by 65% and 50%, respectively, when cinacalcet was administered with a low-fat meal compared with fasting.After absorption, cinacalcet concentrations decline in a biphasic fashion with an initial half-life of approximately 6 hours and terminal half-life of 30 to 40 hours. Steady-state drug levels are achieved within 7 days, and the mean accumulation ratio is approximately 2 with once daily oral administration. The median accumulation ratio is approximately 2 to 5 with twice daily oral administration. The AUC and Cmax of cinacalcet increase proportionally over the dose range of 30 to 180 mg once daily. The pharmacokinetic profile of cinacalcet does not change over time with once daily dosing of 30 to 180 mg. The volume of distribution is approximately 1000 L, indicating extensive distribution. Cinacalcet is approximately 93% to 97% bound to plasma protein(s). The ratio of blood cinacalcet concentration to plasma cinacalcet concentration is 0.80 at a blood cinacalcet concentration of 10 ng/mL. Cinacalcet is metabolized by multiple enzymes, primarily CYP3A4, CYP2D6, and CYP1A2. After administration of a 75 mg radiolabeled dose to healthy volunteers, cinacalcet was metabolized via: 1) oxidative N-dealkylation to hydrocinnamic acid and hydroxy-hydrocinnamic acid, which are further metabolized via β-oxidation and glycine conjugation; the oxidative N-dealkylation process also generates metabolites that contain the naphthalene ring; and 2) oxidation of the naphthalene ring on the parent drug forming dihydrodiols, which are further conjugated with glucuronic acid. The plasma concentrations of the major circulating metabolites, including the cinnamic acid derivatives and glucuronidated dihydrodiols, markedly exceed the parent drug concentrations. The hydrocinnamic acid metabolite and glucuronide conjugates have minimal or no calcimimetic activity. Renal excretion of metabolites was the primary route of elimination of radioactivity. Approximately 80% of the dose was recovered in the urine and 15% in the feces. Age: Geriatric PopulationThe pharmacokinetic profile of cinacalcet in geriatric patients (age ≥ 65 years, n = 12) is similar to that for patients who are < 65 years of age (n = 268) [see Use in Specific Populations (8.5)]. The disposition of a 50 mg cinacalcet hydrochloride tablets single dose was compared between patients with hepatic impairment and patients with normal hepatic function. Cinacalcet exposure (AUC(0-infinite)) was comparable between healthy volunteers and patients with mild hepatic impairment. However, in patients with moderate and severe hepatic impairment (as indicated by the Child-Pugh method), cinacalcet exposures (AUC(0-infinite)) were 2.4 and 4.2 fold higher, respectively, than that in healthy volunteers. The mean half-life of cinacalcet increased from 49 hours in healthy volunteers to 65 hours and 84 hours in patients with moderate and severe hepatic impairment, respectively. Protein binding of cinacalcet is not affected by impaired hepatic function [see Use in Specific Populations (8.7)]. The pharmacokinetic profile of a 75 mg cinacalcet hydrochloride tablets single dose in patients with mild, moderate, and severe renal impairment, and those on hemodialysis or peritoneal dialysis is comparable with that in healthy volunteers [see Use in Specific Populations (8.6)]. Standard lifetime dietary carcinogenicity bioassays were conducted in mice and rats. Mice were given cinacalcet at dietary doses of 15, 50, and 125 mg/kg/day in males and 30, 70, and 200 mg/kg/day in females (exposures up to 2 times those resulting with a human oral dose of 180 mg/day based on AUC comparison). Rats were given dietary doses of 5, 15, and 35 mg/kg/day in males and 5, 20, and 35 mg/kg/day in females (exposures up to 2 times those resulting with a human oral dose of 180 mg/day based on AUC comparison). No increased incidence of tumors was observed following treatment with cinacalcet. Cinacalcet was not genotoxic in the Ames bacterial mutagenicity assay, nor in the Chinese Hamster Ovary (CHO) cell HGPRT forward mutation assay and CHO cell chromosomal aberration assay, with and without metabolic activation, nor in the in vivo mouse micronucleus assay. Female rats were given oral gavage doses of 5, 25, and 75 mg/kg/day cinacalcet beginning 2 weeks before mating and continuing through gestation day 7. Male rats were given oral doses 4 weeks prior to mating, during mating (3 weeks) and 2 weeks postmating. No effects were observed in male or female fertility at 5 and 25 mg/kg/day (exposures up to 3 times those resulting with a human oral dose of 180 mg/day based on AUC comparison). At 75 mg/kg/day, there were slight adverse effects (slight decreases in body weight and food consumption) in males and females. Three 6-month, multicenter, randomized, double-blind, placebo-controlled clinical studies of similar design were conducted in patients with CKD on dialysis. A total of 665 patients were randomized to cinacalcet hydrochloride tablets and 471 patients to placebo. The mean age of the patients was 54 years, 62% were male, and 52% were Caucasian. The average baseline iPTH level by the Nichols IRMA was 712 pg/mL, with 26% of the patients having a baseline iPTH level > 800 pg/mL. The mean baseline Ca x P product was 61 mg2/dL2. The average duration of dialysis prior to study enrollment was 67 months. Ninety-six percent of patients were on hemodialysis and 4% on peritoneal dialysis. At study entry, 66% of the patients were receiving vitamin D sterols and 93% were receiving phosphate binders. 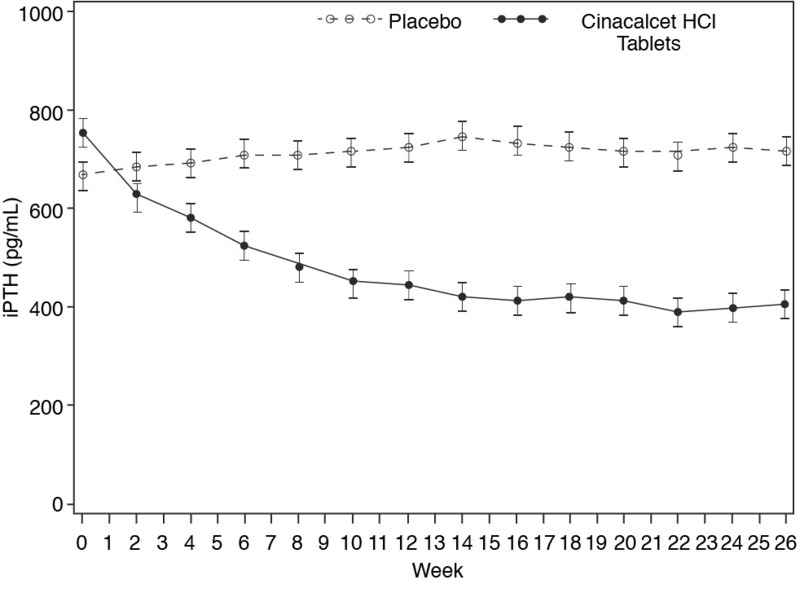 Cinacalcet hydrochloride tablets (or placebo) was initiated at a dose of 30 mg once daily and titrated every 3 or 4 weeks to a maximum dose of 180 mg once daily to achieve an iPTH of ≤ 250 pg/mL. The dose was not increased if a patient had any of the following: iPTH ≤ 200 pg/mL, serum calcium < 7.8 mg/dL, or any symptoms of hypocalcemia. If a patient experienced symptoms of hypocalcemia or had a serum calcium < 8.4 mg/dL, calcium supplements and/or calcium-based phosphate binders could be increased. If these measures were insufficient, the vitamin D dose could be increased. Approximately 70% of patients in the cinacalcet hydrochloride tablets arm and 80% of the patients in the placebo arm completed the 6-month studies. In the primary efficacy analysis, 40% of the patients on cinacalcet hydrochloride tablets and 5% of placebo-treated patients achieved an iPTH ≤ 250 pg/mL (p < 0.001) (Table 6, Figure 1). These studies showed that cinacalcet hydrochloride tablets reduced iPTH while lowering Ca x P, calcium, and phosphorus levels (Table 6, Figure 2). The median dose of cinacalcet hydrochloride tablets at the completion of the studies was 90 mg. Patients with milder disease typically required lower doses.Similar results were observed when either the iPTH or biointact PTH (biPTH) assay was used to measure PTH levels in CKD patients on dialysis; treatment with cinacalcet did not alter the relationship between iPTH and biPTH.Table 6. 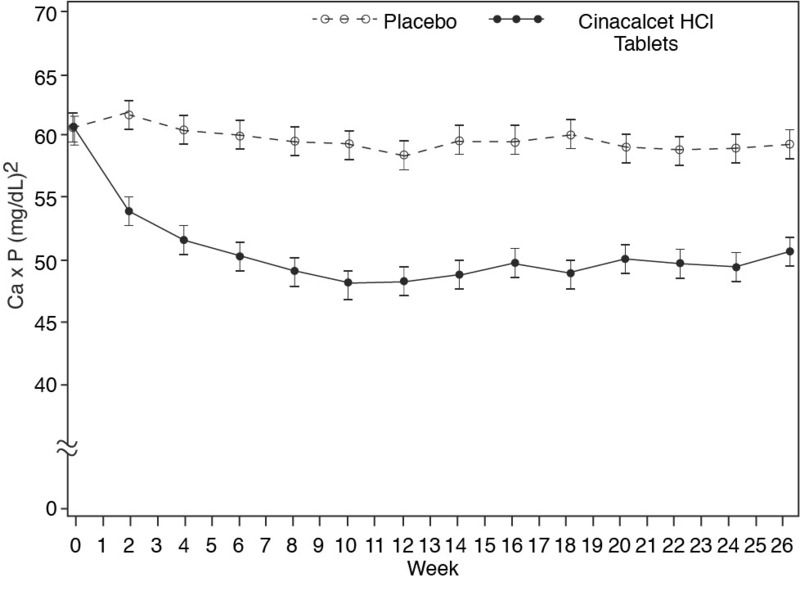 Effects of Cinacalcet Hydrochloride Tablets on iPTH, Ca x P, Serum Calcium, and Serum Phosphorus in 6-month Phase 3 Studies (Patients on Dialysis)Study 1Study 2Study 3PlaceboCinacalcet Hydrochloride TabletsPlaceboCinacalcet Hydrochloride TabletsPlaceboCinacalcet Hydrochloride Tablets(n = 205)(n = 205)(n = 165)(n = 166)(n = 101)(n = 294)iPTH Baseline (pg/mL): Median535537556547670703 Mean (SD)651 (398)636 (341)630 (317)652 (372)832 (486)848 (685) Evaluation Phase (pg/mL)563275592238737339 Median Percent Change+3.8-48.3+8.4-54.1+2.3-48.2 Patients Achieving Primary Endpoint (iPTH ≤ 250 pg/mL) (%)iPTH value based on averaging over the evaluation phase (defined as weeks 13 to 26 in studies 1 and 2 and weeks 17 to 26 in study 3) Values shown are medians unless indicated otherwise.4%41%P < 0.001 compared with placebo; p-values presented for primary endpoint only.7%46%6%35% Patients Achieving ≥ 30% Reduction in iPTH (%)11%61%12%68%10%59% Patients Achieving iPTH ≤ 250 pg/mL and Ca x P < 55 mg2/dL2 (%)1%32%5%35%5%28%Ca x P Baseline (mg2/dL2) 626161616159 Evaluation Phase (mg2/dL2) 595259475748 Median Percent Change-2.0-14.9-3.1-19.7-4.8-15.7Calcium Baseline (mg/dL) 9.89.89.910.09.99.8 Evaluation Phase (mg/dL) 9.99.19.99.110.09.1 Median Percent Change +0.5-5.5+0.1-7.4+0.3-6.0Phosphorus Baseline (mg/dL) 6.36.16.16.06.16.0 Evaluation Phase (mg/dL) 6.05.65.95.15.65.3 Median Percent Change -1.0-9.0-2.4-12.4-5.6-8.6Figure 1. Mean (SE) iPTH Values (Pooled Phase 3 Studies)Data are presented for patients who completed the studies; Placebo (n = 342), Cinacalcet Hydrochloride Tablets (n = 439).Figure 2. Mean (SE) Ca x P Values (Pooled Phase 3 Studies)Data are presented for patients who completed the studies; Placebo (n = 342), Cinacalcet Hydrochloride Tablets (n = 439).Reductions in iPTH and Ca x P were maintained for up to 12 months of treatment.Cinacalcet hydrochloride tablets decreased iPTH and Ca x P levels regardless of disease severity (i.e., baseline iPTH value), duration of dialysis, and whether or not vitamin D sterols were administered. Approximately 60% of patients with mild (iPTH ≥ 300 to ≤ 500 pg/mL), 41% with moderate (iPTH > 500 to 800 pg/mL), and 11% with severe (iPTH > 800 pg/mL) secondary HPT achieved a mean iPTH value of ≤ 250 pg/mL. Plasma iPTH levels were measured using the Nichols IRMA. Twenty-nine patients with Parathyroid Carcinoma were enrolled in a single-arm, open-label study. The study consisted of two phases, a dose-titration phase and a maintenance phase. Patients initially received 30 mg cinacalcet twice daily and then were titrated every 2 weeks to a maximum dose of 90 mg four times daily. Dosage escalation during the variable-length (2 to 16 weeks) titration phase continued until the serum calcium concentration was ≤ 10 mg/dL (2.5 mmol/L), the patient reached the highest possible dosage, or adverse events precluded further dosage increases.Twenty-nine patients entered the study. The median exposure to cinacalcet was 229 days (range: 1 to 1051). At baseline the mean (SE) serum calcium was 14.1 (0.4) mg/dL. At the end of the titration phase, the mean (SE) serum calcium was 12.4 (0.5) mg/dL, which is a mean reduction of 1.7 (0.6) mg/dL from baseline. Figure 3 illustrates mean serum calcium (mg/dL) over time for all patients still on study at each time point from the beginning of titration to study visit week 80. Daily dose during the study ranged from 30 mg twice daily to 90 mg four times daily.Figure 3. Serum Calcium Values in Patients With Parathyroid Carcinoma Receiving Cinacalcet Hydrochloride Tablets at Baseline, Titration, and Maintenance Phasen = Number of patients with non-missing values at the timepoint.End of Titration (EOT) phase could occur at any visit from week 2 to 16. Patients at EOT are those who completed titration. Seventeen patients with severe hypercalcemia due to primary HPT, who had failed or had contraindications to parathyroidectomy, participated in an open-label, single-arm study. The study consisted of two phases, a dose-titration phase and a maintenance phase. In this trial severe hypercalcemia was defined as a screening serum calcium level of > 12.5 mg/dL. Patients initially received 30 mg cinacalcet twice daily and then were titrated every 2 weeks to a maximum dose of 90 mg 4 times daily. Dosage escalation during the variable-length (2 to 16 weeks) titration phase continued until the serum calcium concentration was ≤ 10 mg/dL (2.5 mmol/L), the patient reached the highest possible dosage, or adverse events precluded further dosage increases.Seventeen patients entered the study. The median exposure to cinacalcet was 270 days (range: 32 to 1,105). At baseline the mean (SE) serum calcium was 12.7 (0.2) mg/dL. At the end of the titration phase the mean (SE) serum calcium was 10.4 (0.3) mg/dL, which is a mean reduction of 2.3 (0.3) mg/dL from baseline. Figure 4 illustrates mean serum calcium (mg/dL) over time for all patients still on study at each time point from the beginning of titration to study visit week 80. Daily dose during the study ranged from 30 mg twice a day to 90 mg four times a day.Figure 4. Mean Serum Calcium (SE) at Baseline, End of Titration, and Scheduled Maintenance Visits (Patients with Severe intractable primary HPT)n = Number of patients with non-missing values at the timepoint.End of Titration (EOT) phase could occur at any visit from week 2 to 16. Patients at EOT are those who completed titration. Cinacalcet Hydrochloride Tablets 30 mg are formulated as light-green, oval-shaped, film-coated tablets marked with “30” on one side and “CN” on the other side, packaged in bottles of 30 tablets. (NDC 70436-007-04)Cinacalcet Hydrochloride Tablets 60 mg are formulated as light-green, oval-shaped, film-coated tablets marked with “60” on one side and “CN” on the other side, packaged in bottles of 30 tablets. (NDC 70436-008-04)Cinacalcet Hydrochloride Tablets 90 mg are formulated as light-green, oval-shaped, film-coated tablets marked with “90” on one side and “CN” on the other side, packaged in bottles of 30 tablets. (NDC 70436-009-04)StorageStore at 25ºC (77ºF); excursions permitted from 15°C to 30ºC (59°F to 86ºF). [See USP Controlled Room Temperature].